Toss your VMs into the clouds and easily get them back again with Boomerang » Welcome to vSphere-land! Not everyone wants to run their production VMs off premise in a public cloud but there are definitely some situations where leveraging cloud based virtualization for some specific scenarios makes a lot of sense. Let’s look at a few scenarios where you might consider moving some VMs to a public cloud infrastructure and a great solution from Unitrends called Boomerang that can make the transition from private data center to public cloud and back again simple and painless. Upgrading your virtual environment to a new version of vSphere can be both disruptive and stressful. As a VMware administrator I was both excited and fearful when it came time to upgrade to newer versions. Excited to start enjoying all the new features and enhancements but scared to death that something might break in a big way as a result of the upgrade. I’ll even admit I’ve stayed on older versions of vSphere way too long just because I didn’t want to go through the hassle and disruptions of an upgrade. My preferred upgrade method to major new vSphere releases is to setup a new environment running the latest version of vSphere and then once I am sure that everything is running smooth in the new environment migrate VMs from the old environment to it. This method also provides you with an easy fallback method in case you have issues with your new environment. To do this though means you have to have new or spare hardware available which can be a showstopper unless you are close to a multi-year hardware refresh cycle. Having a short-term off-site virtual environment available allows you to move your VMs off your existing hosts while you perform upgrades and then move them back once your upgraded virtual environment is ready. One of the big reasons that companies are still using tape backups today is for off-premise storage of backed up VMs. You can’t afford to have your virtual environment and backups of it all in one location as a single disaster could take out both and leave you without any recovery options. Many companies have also moved to disk-based backup targets which provides more recovery options and faster recovery, replication is also widely used to provide duplicate copies of critical VMs. Doing backup and replication to an off-premise public cloud has many advantages including having your virtual environment and backup environment physically separated by distance, no ongoing capex or opex costs for a backup environment and less administration. You also get the benefits of having disk-based backups and having them off-premise so you can easily recover if something happens at your primary site. This is especially beneficial to smaller companies that may not be able to afford the cost of implementing a backup infrastructure and may not have the expertise or time to manage it. If you work in retail you almost always have to deal with seasonal demand peaks which your virtual environment may not have adequate resources to handle effectively. Unless you don’t care about money, short term demand increases are a challenge for every company. To be able to meet these big spikes you have to size your virtual environment way larger then it needs to be to meet your typical everyday workload demands. If you do this you are just wasting money as the rest of the time you have too many physical resources just sitting there not being used. The whole purpose of virtualization is to be efficient with physical resources and maximize resource usage. Sizing to met short term peaks goes against the goals of virtualization. However you can’t afford to not be able to handle those peaks though and a great solution is to expand your environment when needed to the public cloud. That way your virtual environment can temporarily grow to a public cloud when it needs to accommodate heavy demand without having to buy and maintain all that extra equipment that you may only need for 30 days out of the year. This method is referred to as “cloudbursting”. All these scenarios require a method of getting your VMs from your private data center to a public cloud and back again, preferably in a way that is easy and cost-effective. To help with this Unitrends recently announced Boomerang which enables virtualization administrators to simply and affordably move VMs from a vSphere environment to Amazon Web Services (AWS) public cloud. How it works is you deploy a Unitrends Boomerang virtual appliance in your vSphere environment and then sign-up for an Amazon Web Services (AWS) account. Amazon has a Free Tier available that allows you to try out AWS for free for 12 months. In addition they provide a resource usage based pricing model so you are not paying for hardware that you don’t need or use. Once Boomerang is installed you setup a Protection Group in your vSphere environment which defines which VMs you want to replicate to AWS, you can then configure an automated backup and ongoing synchronization schedule. Once you setup a Protection Group you simply click ‘Replicate’ which will kick off an efficient replication process of your VMs within your Protection Group to AWS storage. This process typically takes 15-20 minutes for an 8GB sized VM. When the replication process is complete, you can click the ‘Deploy’ button to spin up (or power up) the VM into a running EC2 instance. Once you are happy with the newly deployed instance in AWS, you can power down your original VM at your leisure, thus completing the migration process. When you want to bring VMs back you can “CopyBack” deployed instances inside AWS back into your vSphere environment by simply clicking the “Copy Back” button next to the “Deployed Instance” in the Boomerang Management Dashboard. To use Boomerang, it simply costs $29.95 to protect each VM per month, or if you pay annually it’s only $19.95 for each VM per month. The first VM you protect is for free forever. 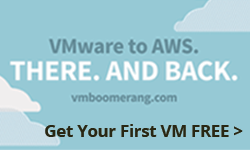 Unitrends also supports a free 30 days trial for unlimited VMs, couple that with the AWS Free Trial and it costs you next to nothing to try out Boomerang and extend your virtual environment into the clouds. To find out more check out the vmboomerang website.